At this year’s TEDxDePaulUniversity, Whitney Spencer encouraged the audience to question societal norms with her talk, Reimagining the Intellectual. A first-year graduate student in DePaul’s Critical Ethnic Studies program, Spencer highlighted that America’s understanding of what it means to be “an intellectual” is limited by preconceived racial stereotypes. DePaul University’s College of Liberal Arts and Social Sciences is among the first in the nation to offer a Master of Arts in Critical Ethnic Studies, which supports the study of such topics by providing an advanced analysis of race and ethnicity. Founded in 2015, the program’s second cohort will graduate this June. With Chicago as a classroom, students like Spencer examine the systematic marginalization of racial minorities within an urban context as well as the global implications of these structures. This includes a look at how groups use art, culture, political organization and other forms of social expression to respond and counter these forces. 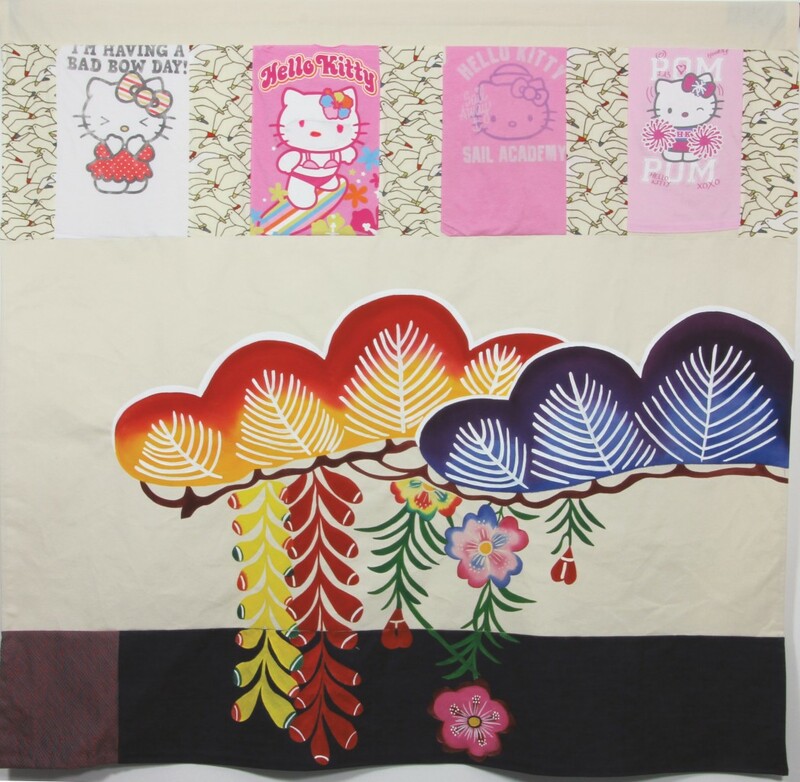 Image: Laura Kina, Hello Kitty, acrylic on canvas and denim, assorted fabrics, t-shirts from the artist’s daughter Midori Aronson, 57 x 56 inches, 2015. Uchinanchu is the term for Okinawan immigrants and their descendants from the Japanese island living in Hawai’i. This exhibit presents patchwork and textile-based paintings by Laura Kina through moving autobiographical pieces that examine mixed race identities, indigenous communities, colonization, and globalized pop culture–all in the form of traditional craft practices. Images feature deconstructed articles of clothing, from fleeting moments and memories of specific events to time-honored symbols. Kina is Vincent de Paul Professor of Art, Media, & Design at DePaul University in Chicago and co-founder of the biennial Critical Mixed Race Studies conference. She co-authored War Baby/Love Child: Mixed Race Asian American Art (University of Washington Press, 2013) and acts as reviews editor for Asian Diasporic Visual Cultures and the Americas. She is working on a forthcoming anthology Queering Contemporary Asian American Art. Her work has been widely exhibited in galleries and museums nationally and internationally, including in the Smithsonian National Museum of American History and the Japanese American National Museum. Meet today’s Fused Society contributor, the accomplished Laura Kina! “Laura Kina is a multiracial Asian American artist based in Chicago who identifies as “hapa, yonsei, and Unchinanchu” (mixed race, 4th generation Japanese American, and part of the Okinawan diaspora). Her father is Okinawan from Hawaiʻi and her mother is Anglo American (Spanish/Basque and French, English, Scottish, Irish, Dutch) from the Pacific Northwest. Kina’s artwork, scholarly research and activism center on themes of distance and belonging. She focuses on the fluidity of cultural difference and the slipperiness of identity. Asian American history and mixed race representations are subjects that run through her work. Laura Kina, Canefield Workers, 2013, oil on canvas, 30 x 45 inches. “You won’t find Elvis or surfboards or funny umbrella-topped cocktails in my dystopic Blue Hawai’i.” The Chicago-based artist Laura Kina speaks of her latest series of paintings which are featured in this exhibition. Drawn from her family albums, oral history and community archives, Kina’s ghostly oil paintings employ distilled memories to investigate themes of distance, longing, and belonging. The setting of these paintings is her father’s Okinawan sugarcane field plantation community, Piʻihonua, on the Big Island of Hawaiʻi near Hilo. The predominant blue color of the series was inspired by the indigo-dyed kasuri kimonos repurposed by the Issei (first generation) “picture bride” immigrants for canefield work clothes. Blue Hawaiʻi echoes the spirits of Kina’s ancestors and shared histories of labor migration. In 2009, Kina accompanied her father back to his hometown community in Hawaiʻi to interview him along with other Nisei (second generation) and Sansei (third generation) about their memories of plantation life. In 2012, she traveled to Okinawa with her father, collecting stories of heritage and history. She learned of her grandmother and great aunts having been Kibei Nisei, i.e., sent to Japan for their education and that in the devastation of WWII and the Battle of Okinawa, four family members were killed–two by forced suicide. As U.S. relatives ceased to use the Okinawan dialect of Uchinaguchi or standard Japanese, stories like these were lost. In Blue Hawaiʻi, Kina seeks to reclaim these histories via reanimated traces from old photographs and present-day vestiges visible in paintings such as “Okinawa—All American Food” and “Black Market,” which capture the remnants of war and a continued American military presence in contemporary Okinawa. Risking distortion, misreading, nostalgia and erasure, the artist fully engages in, what she calls, “the messy business” of memory, collapsing time and space into one Blue Hawaiʻi. For more about the exhibition, view an on-line catalog here.